Jeremy Corbyn was accused of 'juvenile' behaviour this evening after walking out on a crucial Brexit briefing with party leaders because former Labour MP Chuka Umunna was invited. The Labour Leader is thought to have refused to sit down with the Independent Group spokesman as 'he's not a real party leader'. Mr Corbyn was slammed online for failing to join the cross-party meeting organised by the Prime Minister, despite there being only nine days until the UK's scheduled departure from the EU. 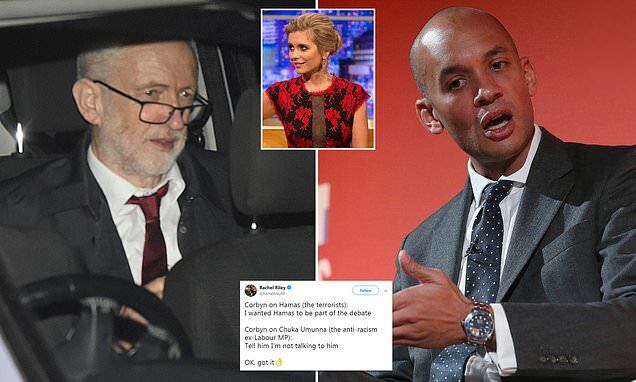 Leading the criticism, Countdown presenter Rachel Riley mocked Mr Corbyn for meeting with Hamas - the military wing of which is a banned terrorist group in the UK - but refusing to talk with Mr Umunna. The presenter - who has been a victim of anti-Semitic abuse from hard-left activists - wrote on Twitter: 'Corbyn on Hamas (the terrorists): I wanted Hamas to be part of the debate. Mr Umunna, who is not officially the leader of the newly formed Independent Group but instead an appointed 'spokesman', described Jeremy Corbyn's refusal to engage in talks as 'extraordinary' and 'very juvenile'. Speaking to Sky News in a clip he shared to Twitter, Mr Umunna said: 'We are in a crisis situation here where the people of this country expect their representatives from different political groupings in Parliament to come together and actually chart a way forward. 'That is why the Prime Minister convened the meeting, I welcomed the fact that she did so.